Brake Footpiece set by Medline is designed to provide safe and smooth movement when used with front wheels. 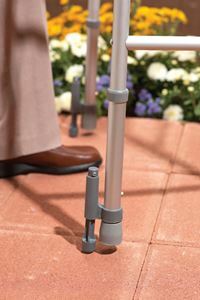 When weight is placed on the walker, the brake slowly puts the rubber part on the floor. The brake footpiece would be 1" diameter.